Have you ever wondered what makes a strudel so buttery, flaky, moist and tasty? Is it the ingredients, or the assembly process, or perhaps certain baking techniques? According to a Slovak grandma, it’s all of the above. Recently, I had the pleasure of spending a Sunday afternoon with a Slovak neighbor, her mother, Eleanor, and her 11 year old granddaughter, and we learned the secrets of how to make mouth watering strudel. Eleanor’s strudel is so well loved by her friends that they once tried to convince her to sell it at Costco. After tasting it, I believe it. I’ll go over the ingredients below, and next time I’ll describe the assembly process and Eleanor’s tips for baking and freezing the strudel. Pauline used to use homemade breadcrumbs mixed with sugar in her apple and walnut strudels, but Eleanor’s secret is to use crushed vanilla wafers. Eleanor explains that breadcrumbs are all that Slovaks had way back when, but now we have wafers, and they are much tastier than breadcrumbs and sugar. Eleanor mixes a box with about 1 1/2 sticks of melted butter. Don’t be shy with the butter. You’ll probably have lots of buttery crumbs left, and you can use the leftovers as the base for a cheesecake, as Eleanor did. You’ve got to use firm apples, cored, peeled and sliced about 1/4 of an inch thick at most, or your strudel will be too lumpy. 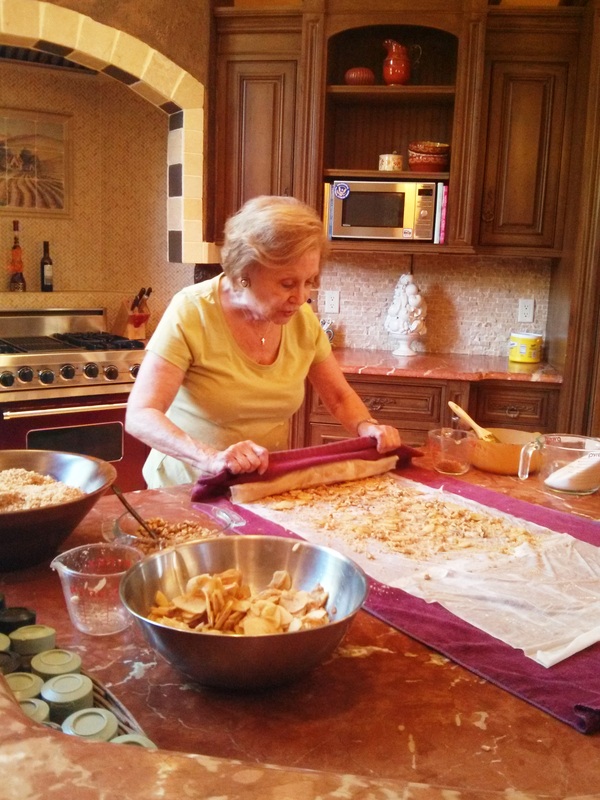 When I was a kid, Pauline and I made the phyllo from scratch, as we did recently in Slovakia with a great aunt. Eleanor did too with her mom, but today she uses the store bought variety. She’s lucky enough to find it freshly made in Chicago at a local deli. But if you must buy it from a grocery store, avoid the grocery store labels, and look for a Greek brand, like Athens. For an apple and walnut strudel, you’ll need 4 sheets. Keep them covered with a damp cloth as you work. For cheese or poppy seed, you’ll need three sheets. One box comes with about 18 sheets, so you can make 4 apple walnut strudels from that, or 6 cheese or poppy seed strudels. Do you ever have problems with your phyllo being too hard and brittle, or difficult to separate the sheets? That’s because the store has allowed the shipment of phyllo to thaw before placing it in the freezer section of the grocery store. You can’t refreeze phyllo or this is what happens. 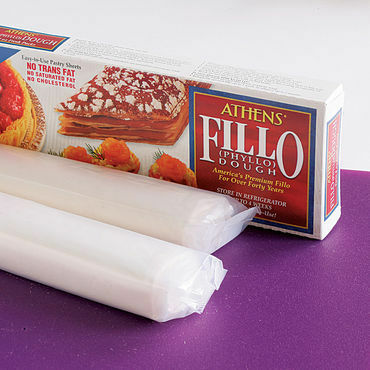 Phyllo lasts about a year in the freezer, and to thaw it, you need to set it in your fridge overnight. Don’t throw away the scraps! We’ll discuss how to use them in the next blog article about assembling the strudel. To make cheese stuffed strudel, you’ll need about 32 ounces of ricotta cheese. Mix it with two eggs and some sugar, and a little cornstarch to give it lift and body while it bakes, otherwise the strudel will be as flat as a pancake. And what do you place on the strudel layer with the cheese to give it sweetness and moisture? Eleanor uses about 1/3 of a cup of well squeezed chopped pineapple from a can! I would have never guessed it, but it really gives the strudel a subtle burst of flavor. Again, you’ll have plenty of leftovers, most likely, and you can use that for the cheesecake. Don’t be a wimp and buy the tiny bottles that masquerade as poppy seeds. Again, Eleanor’s Chicago sources provide her with access to freshly ground poppy seeds mixed with sugar. If you can’t find a fresh source, try the brand Solo, which I found online for the outrageous price of $34 online from Walmart. Solo comes already ground and mixed with sugar as well. I buy fresh poppy seeds in a bag from a spice store like Penzey’s Spices or from Rocky Peanut, a wholesale gourmet supply market in Detroit across the street from Eastern Market. Of course, you have to grind the seeds and add the sugar yourself. I’ve tried using coffee grinders for the job, and burned them both out. I suggest ordering a poppy seed grinder, which costs less than a can of Solo. There really is such a thing, such as this one that my dad uses, or this electronic Miracle one. I asked Eleanor if her mother made cabbage strudel, and she replied that her family “didn’t need to”, meaning they were well enough off not to have to eat cabbage, which was a badge of honor back in the cold war days. Well, mine ate it both behind the iron curtain and on the farm in Ontario, and we loved it. Cabbage is one of the most nutritious vegetables you can eat, and besides that, it’s really delicious in strudel. Pauline used to braise the strudel on the stove, squeeze it dry with paper towel, and then mix in just a spoon or two of sugar. Braising it brings out the natural sweetness of the cabbage. I also add a grind or two of cracked pepper, as I love the sweet and peppery combination. Strangely, peppered cabbage makes a great dessert. You need lots of butter for strudel making. Don’t think about it, just pull out about 2 boxes, or 8 sticks. You’ll be melting it all for crumbs and for brushing on the pastry. Eleanor keeps it in a small pot on the stove beside her as she assembles it, so that it’s always nearby and melted. You’ll need about 1 cup of roughly chopped or whole walnuts per strudel. This is one of Eleanor’s top secret ingredients for poppy seed strudel. 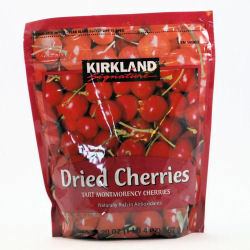 She buys a large bag of them from Costco, and then macerates about 1/2 cup per strudel in her favorite liquor overnight. These plumped up cherries then get tossed into the poppy seed strudel, and provide the much needed moisture with the dry seeds. They also provide a succulent flavor, but they don’t taste like cherries in the strudel. I’ll be back again soon to talk about how to lay out the strudel, how to roll it, tuck and butter it, and provide more tips from Eleanor on freezing and serving the strudel. Using Cookie crumbs sounds good and I might try it . My Mother and Grandmother used fried breadcrumbs which gave it a delicious flavor. The crumbs are meant to absorb the liquids which would prevent the dough from beimg crispy. Looks like Eleanor’s cookbook would also be a treasure volume alongside Pauline’s. Don’t keep us waiting too long for next mouth-watering step. You can order fresh strudel on line.